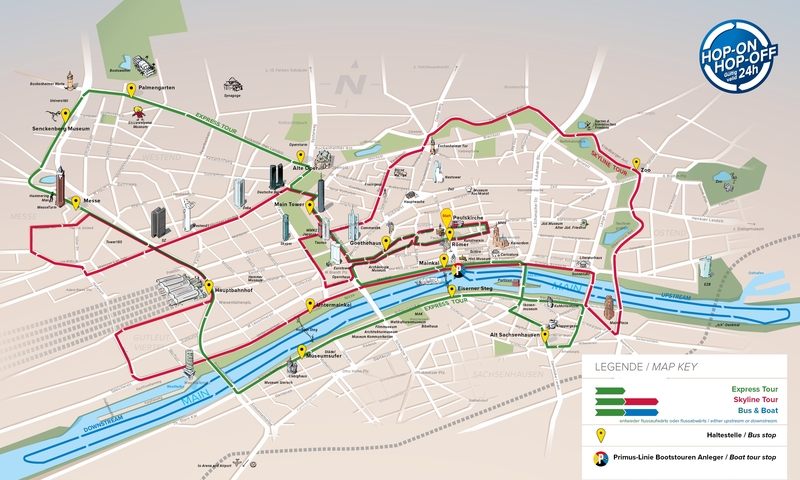 Which is Best Frankfurt Hop on Hop Off Bus Tour? See the best of Frankfurt by taking a guided bus tour during your stay. This is a good way to get around the main sights and see everything without having to research it all yourself, or work out the public transport system. There are 2 main companies offering Frankfurt bus tours(Frankfurt Hop On Hop Off Red Bus & City Sightseeing Blue Bus Tours), and we list all the details here for you. These offer slightly different routes, and we suggest checking which of these matches your plans best. They both offer simple per day pricing. Frankfurt hop-on hop-off Red Bus Tour goes through 23 routes covering all the major attractions in Frankfurt. The tours come with two options- one a full day unlimited hop-on hop-off pass and the other, one-hour 1 loop ride. It offers live audio commentary on headphone in 10 languages. The voucher is valid throughout the year. Frankfurt Blue Bus Hop on hop off city tour is a simple one day, one route tour. You can hop-on and hop-off unlimited times and can discover all the major landmarks of Frankfurt at your own pace. These blue coloured double decker buses also offer live audio commentary on headphone in 12 languages. You can redeem the voucher any day of the year and enjoy the views from the open bus if the weather is good. Print the voucher in your mail and show it to the bus official. Show the mobile or printed voucher to the bus official. 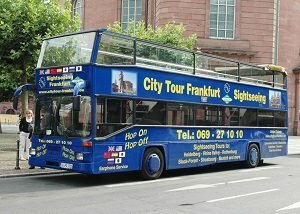 Where to Buy Frankfurt City Sightseeing Blue Bus Tours? We are comparing the Best Frankfurt Hop On Hop Off City Sightseeing Red Bus tour Prices from leading online Tours and Ticket suppliers, try to find you cheap tickets prices on the market. Where to Buy Frankfurt Hop-On Hop-Off Tour Red Bus Tours? Explore Germany's financial capital city Frankfurt in style and class, in a comfortable and easy hop-on-hop-off city sightseeing blue bus tours. The Frankfurt city sightseeing blue bus tours allow users the privilege to hop-on and hop-off at any of the 14 stops, or seat tight on top the double-decker open-top bus while admiring the top sights and attractions in Frankfurt. You also get headphones to listen to the pre-recorded audio guide in 12 different languages. The 14 stops are spread across Frankfurt's top attractions such as the St. Paul's Church, Romer (Town Hall), the beautiful and impressive Opera House, and the Botanical Garden Palmengarten. The amazing part of this tour is, you get to enjoy your tour of these major attractions in Frankfurt with just a 24-hour ticket. Explore the ancient and modern parts of Frankfurt from the old remains of the age-long City Walls to the highest continental skyscrapers in Europe. Choose whichever stop you wish to hop-on and hop-off for a closer picture of the city's attractions. You hop-off at any interesting stop for a personal walking tour in Frankfurt. This ticket gives you discounts at some selected attractions and leisure activities in Frankfurt. How much is a 1/2/3 day Blue Bus Hop on hop off Frankfurt Cost? Children under 4 years ride the Frankfurt City Sightseeing Blue Bus for free. Bus stops: Hauptbahnhof or Berliner Straße (opposite St Paul's Church), Museum Riverbank, Eiserner Steg (Iron Footbridge)/Sachsenhausen, Haus der Jugend, Affentorplatz/Altes Sachsenhausen, Eiserner Steg (Iron Footbridge)/Cathedral/Romer, Hauptwache, Berliner Strasse/Paulsplatz, Banking Quarter, Opernturm, Palmengarten, Senckenberg Museum, Messe Frankfurt, Palais Thurn and Taxis (only in summer). The Frankfurt city sightseeing blue bus tour is a comprehensive way of getting accustomed to the German financial capital. Frankfurt has amazing sights which tourists can explore with pleasure one after another. With just a 24-hour ticket, you get an overview of Frankfurt onboard the comfy Frankfurt city sightseeing blue bus tour. The blue tour bus service has 14 stops which cut across the city's major attractions, with a pre-recorded audio commentary in 12 different languages and panoramic windows to see interesting sites. You can hop-on and hop-off at any of the stops that interests you the most for a personal walking tour all at your own pace; or also decide to end your tour at any stops as well. This is an amazing way to see the ancient historical sites in Frankfurt and its modern architecture as well. Is the Frankfurt Blue Bus City tour Right for Me? This tour is right for anyone who intends to spend their time and money in Frankfurt; Germany's financial capital city and also get value for their money. 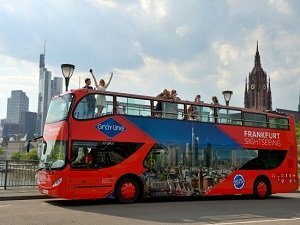 Hop aboard the convenient and easy Frankfurt city sightseeing blue bus and tour Frankfurt in style with 14 stops that are spread across the city's top attractions with an onboard audio commentary in 12 languages explaining the facts about these sites. Hop-off at any stop for a closer look at these sites and hop back on at the next stop. Plan your trip and tour Frankfurt at your own convenience with a 24-hour ticket. That's all you need to explore this beautiful city. Experience the exciting and amazing Frankfurt city on a double-decker open-top bus. The Frankfurt City Hop-On Hop-Off Tour Gray Line Red Bus lets you discover the city's main attractions and see its modern architecture as well. Choose between a 24-hour hop-on-hop-off Express or Skyline Tours and explore Frankfurt's city center at your own time. Get off at any of the 16 stops to see sights closer and hop back on at the next stop, while onboard; enjoy the audio commentaries in 10 different languages. Enjoy both tours separately or opt for the Skyline tour which includes the Express Tour. You get to stroll along the museum embankment from the bus and also embark on a personal walking tour to see Frankfurt on your own. This ticket gives you discounts at some selected restaurants, shops, shows, attractions and leisure activities in Frankfurt. How much is a 1/2/3 day Red Bus Hop-On Hop-Off Frankfurt? All children under 5 years ride the Frankfurt City Hop-On Hop-Off Tour Gray Line Red Bus for free. We are comparing the Best Frankfurt City Hop-On Hop-Off Tour Red Bus Prices from leading online Tours and Ticket suppliers, try to find you cheap tickets prices on the market. 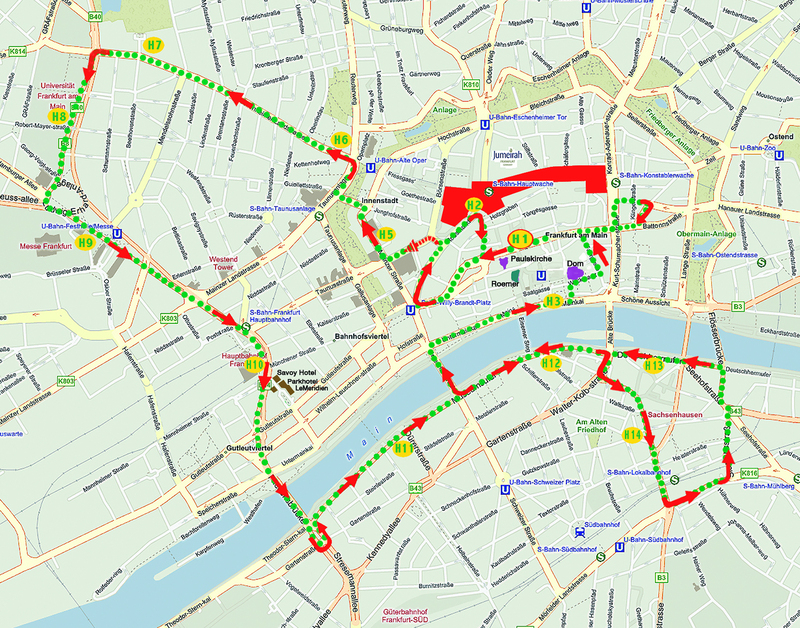 Bus stops: Saint Paul's Cathedral, "Romer" Town Hall, Goethe House, Main Tower, "Alte Oper" Opera House, "Palmengarten" Botanic Garden, "Senkenberg" Museum, Trade Fair Centre, Central Station, "Riverbank Museums", "Eiserner Steg" Pedestrian Bridge, "Alt Sachsenhausen" Pub District, "Untermainkai" Riverside Avenue, "Mainkai" Riverside Avenue, Frankfurt Zoo, "Hauptwache" Square. Frankfurt City Hop-On Hop-Off Tour Gray Line Red Bus is an amazing way for tourists to soak up in the city's history both old and new. With a 24-hour Express city ticket, you get to see all the wonderful sights there are in Frankfurt, as well as the opportunity to get close and personal. The Skyline city ticket lets you see the beautiful skylines in Frankfurt and it also includes the express ticket. Aboard the open-top double-decker bus, you get a panoramic view of Frankfurt with an audio guide in 10 different languages to guide you through all the top attractions at all the stops. The 16 stops take you across all the amazingness and attractions in the city such that you don't get to miss a thing. You get to see beautiful places like the St. Paul's Church, Palmengarten, Senckenberg Museum and the medieval Romer building just to name a few. Is the Frankfurt Red Bus City Tour is Right for Me? As a tourist in Frankfurt looking for an adventure, this tour is one of the most amazing ways to explore the city. You get to see the beautiful city skylines and main attractions up close and admire some of the city's medieval museums and monuments. Board the Frankfurt City Hop-On Hop-Off Tour Gray Line Red Bus and experience the amazingness of Germany's financial capital city. With just a 24-hour ticket, you get access to audio commentary onboard the Gray Line open top double-decker red bus and the choice to hop-off at any stop of your choice to explore on your own. You get to stroll along the museum embankment, see the beautiful the St. Paul's Church, Romer building, Trade Fair Center and Senckenberg Museum. Get a ticket either the Express City ticket or the Skyline ticket (includes the Express Ticket) and start exploring Frankfurt at your pace.